Have you ever experienced a deep connection with someone you just met for the first time? If yes, you’ll know it instantly as you just seem to click with them perfectly. This is exactly what happened to a Kroger store employee, Erin Hoffman, when she first locked eyes with a toddler named Charlie. “She’s kind to everyone, not just me,” Mize told USA Today. Noticing Charlie’s distinct small facial features that looked much like her own, Hoffman asked Mize if he had Down syndrome. “I felt a lot of connection when he was looking at me with his eyes. I can tell by his eyes that he’s connected to me,” Hoffman said. Bonded by the “chromie connection,” Hoffman clicked instantly with Charlie and told Mize a lot about herself. She met little Charlie in the checkout lane and knew they had an unspoken bond. The following week, Hoffman happened to be in the store when Mize and Charlie visited, and they started chatting again. Since then, a beautiful friendship has been forged between Hoffman and Charlie. It became a routine for Mize and Charlie to visit the store every Tuesday just to see their favorite Kroger employee—Hoffman. Hoffman adores little Charlie. She allows the boy to help her bag groceries, and sometimes she gives him a ride on the shopping cart around the store, zipping through the aisles. “I just love playing with him. It feels great inside my heart,” Hoffman said. October is Down Syndrome Awareness Month. So I’d like to make everyone aware of something. Down Syndrome is awesome…. The feeling between them is mutual; Charlie, too, seemingly loves the kind Kroger employee just as much. Whenever Charlie sees Hoffman, his tiny face lights up with joy. The sweet toddler even lets her hold him. “He normally doesn’t like being held by people he doesn’t know, but as you can see in this picture, he is totally comfortable with Erin,” Mize, who took a photo of Hoffman holding Charlie in her arms and showed it to her husband, Philip, wrote on Facebook. “Philip says they have a “chromie connection”!” she further wrote. Seeing Hoffman contributing to society positively, working enthusiastically in a job, showering others with kindness, it gives Mize hope for the future of her little one. 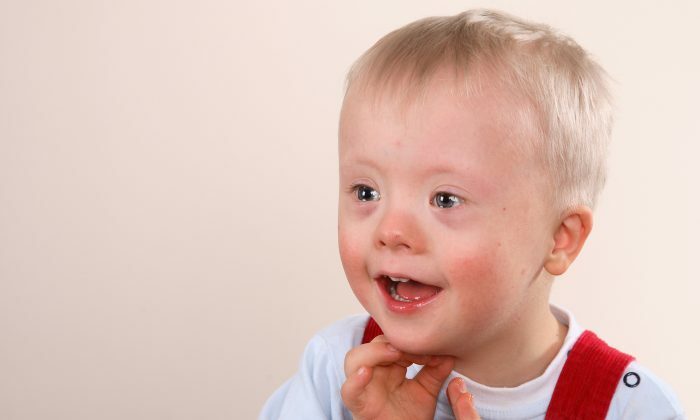 “One of the misconceptions about people with Down Syndrome is that they cannot hold down jobs. Well, clearly Erin is proving that wrong. But more importantly, she is kind, she is smart, she takes pride in her work, and she is making a difference,” Mize wrote. “It gives me hope for Charlie’s future of all the things he might be capable of,” she said. The story of Charlie and Hoffman, shared on the Humankind Stories Facebook page, has since garnered more than 4.5 million views and over 5,400 reactions, warming the hearts of many. “They have down syndrome???? I did not notice. All i saw was 2 absolutely beautiful creations by GOD,” one wrote. “I was a school bus driver for 11yrs transporting special ed [sic] children. Some had down syndrome. Just like all children they have unique personalities and vast capibilities. I loved being their bus driver and friend, they truely [sic] are a blessing and joy to know,” wrote a third one. Thank you, Hoffman, for showing us that people with Down syndrome can succeed at a job and be contributing members of society. We hope that the friendship between Hoffman and Charlie continues to last for a long time to come. And, also that every child with Down syndrome has a wonderful friend like Hoffman.